You crave that feeling of anticipation deep down in your stomach when you get in line for a ride. The lightheaded intoxication that takes over your body when you strap yourself in. The unparalleled rush of excitement you experience when you're hurtling through the air at breakneck speeds. You're not alone. If roller coasters are your thing, then Six Flags Magic Mountain should be right at the top of your theme park bucket list. It has an unprecedented 19 roller coasters — the most of any single theme park in the world. Though there are plenty to choose from, the most intense rides will have even the coolest cucumbers screaming at the top of their lungs. The DC Super Heroes Drop of Doom boasts a 400-foot vertical drop tower enhanced by a virtual reality headset that shows you falling from a tower as the ride free falls at speeds of 85 miles per hour. X² is also guaranteed to get your heart pumping, with seats that twist and flip at 360 degrees while music, sound effects, and fire surround your journey at 76 miles per hour. Known as "The Roller Coaster Capital of the World," this park has 18 stomach-dropping roller coasters, and six of them are over 200 feet tall. Cedar Point has astonishingly been entertaining visitors since it launched its first ride in 1890, and has consistently remained competitive with other parks featuring cutting edge rides. The park is known for its tall roller coasters, including the Millennium Force at 310 feet, and the Top Thrill Dragster with eye-watering speeds of 120 mph and a dizzying maximum height of 420 feet. Yet it’s not all about height. The Maverick roller coaster is just 105 feet tall and reaches speeds of "only" 70 mph, but it’s regularly voted one of the best rides in the country with a vertical drop, inversions, and breathtaking launches. Kings Island is a top pick for more traditional ride fans, possessing four of the best examples of wooden roller coasters you're likely to find. For example, The Beast is the longest wooden roller coaster in the world and has held that record for nearly 40 years since it opened. Then there's the newly built Mystic Timbers, which offers plenty of airtime with speeds up to 53 mph. But it's not all about wooden rides. The park also has a plethora of brilliant and modern structures to make your hair stand on end. The world's longest steel inverted roller coaster, Banshee, will have you screaming like one. Carowinds proudly proclaims itself to have a selection of some of the "biggest and baddest roller coasters around." And the park easily lives up to that statement with giant rides that you can see towering over the surrounding landscape as you approach the park, giving you a good idea of what's in store for your visit. Fury 325 is the cream of the crop, as it's the tallest and fastest giga coaster in the world standing at 325 feet and hitting speeds of 95 mph. Then there's the NASCAR-themed Intimidator, which lives up to its name with seven menacing drops along the race to the finish line. Busch Gardens Williamsburg has a reputation of simultaneously catering to all age groups, making it hugely popular with families. Younger kids will be taken with the Sesame Street Forest of Fun, teens and young adults will revel in the wild thrill rides, while older generations can enjoy craft brews and pretzels in the German themed bars and beer gardens. But just because it effortlessly caters to all ages, doesn't mean it's short on adrenaline-inducing attractions. Apollo's Chariot is an award-winning hypercoaster with "free flight" elevated seating and a combined 825 feet of drops. The classic Loch Ness Monster has been delighting visitors for over 40 years with its double-looping course, and Alpengeist is a favorite among visitors due to its high-tempo inversions mimicking an out-of-control ski lift. Book online and in advance for the best prices, which can be up to 50 percent off general admission for tickets bought at the gate. Booking online will also save you the time it'll take to line up at the front gate to purchase tickets. 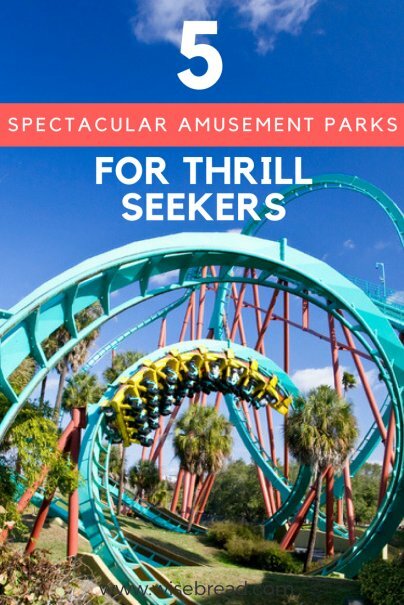 You should also follow your favorite theme parks on social media, as many theme parks regularly dish out discount codes or special offers to their followers.